Institute of Banking Personnel Selection has released the notification for recruitment of various Officer and Assistant post. The recruitment will be conducted through online examination under CRP RRB VI. 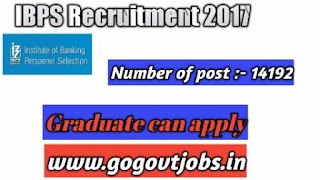 Eligible candidates who wants to apply for Government Banking jobs can apply till 01-August-2017. IBPS RRB released latest recruitment. Number of post 14192. Post Names:- Officer Assistant, Officers Scale I, Officers Scale II and Officers Scale III. Qualification:- Bachelor degree in any discipline and knowledge of computer. Bachelor degree in any discipline and knowledge of computer. SC/ST/PWD candidates to pay Rs 100/- though online mode.